Canada’s Kaitlyn Weaver and Andrew Poje perform their Short Dance at the 2015 ISU Four Continents Championships. 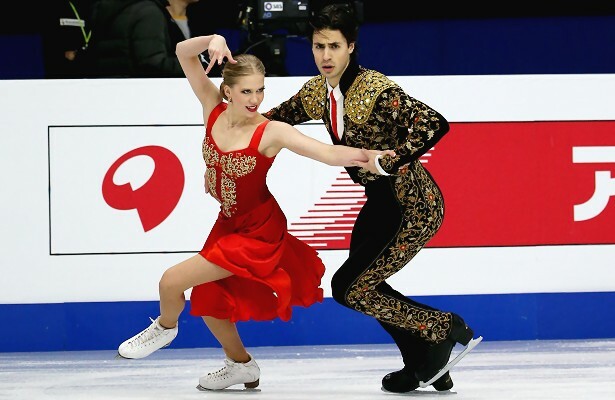 Fresh off winning their first national title, Canadian ice dancers Kaitlyn Weaver and Andrew Poje recently competed at the 2015 ISU Four Continents Figure Skating Championships where they captured the gold. The last time they won gold was in 2010 after they had missed the Vancouver Games. The ice dancers had a great deal of international success this season, most notably on the Grand Prix circuit, and have won every competion in which they have competed. What is slightly unusual is that the ice dancers, who have competed together since 2006, pocketed a world medal (last year) before winning a national title. Although 2010 Olympic champions Tessa Virtue and Scott Moir are sitting out this season, Weaver and Poje are certainly not placeholders. Thus far, the ice dancers are certainly pleased with how things have been going, and like other top athletes, attribute their success to training. “We’ve tried to put in as much work as possible in the beginning half (of the season) and just continue the momentum,” said Poje. “We think we’ve really improved since the Grand Prix Final and have enhanced a lot of the aspects of our programs,” Weaver added. Since the Grand Prix Final, the 2014 World silver medalists have gotten as much feedback as possible and have focused their energy on areas which they felt would make the biggest impact. The Canadian champions divide their training between Toronto, Ont., and Detroit, Mich., under Pasquale Camerlengo, Angelika Krylova and Shae-Lynn Bourne, and are thriving in both environments. Their win at the Grand Prix Final did not hinder their efforts to remain focused and “stay in the moment” at the 2015 Canadian National Figure Skating Championships. Competition at the Four Continents this week was a bit fierce for the Canadians, who battled for placements with USA’s Madison Chock/Evan Bates and Maia Shibutani/Alex Shibutani. Weaver and Poje performed a solid short dance to “La Virgen de la Macarena” which featured a level four lift, however, they only earned a level two on both the twizzles and partial step sequence. When the scores came up, it was evident that Weaver and Poje were confused. The Grand Prix Final champions found themselves in third place with 68.31 points behind Chock/Bates (70.38) and Shibutani/ Shibutani (69.65) going into the free dance. In their routine to Vivaldi’s “The Four Seasons”, Weaver and Poje earned a level four for their twizzles, lifts and dance spin, while the circular and diagonal steps garnered a level three. They picked up 109.15 points, just short of their seasons best, and totaled 177.46 points to capture the gold. With the 2015 World Figure Skating Championships looming ahead, it’s back to work for the eight-time Canadian national medalists, who feel there is still a great deal of room to grow. Staying on the same page season after season is easy for Weaver and Poje, who have competed together since 2006, as they are best friends. Michelle Kwan is tied with Maribel Vinson-Owen for the record (nine) in U.S. ladies’ figure skating titles. More on Michelle Kwan on Golden Skate.